are welcome in my home and garden. I see another variety and change my mind. until I see another favorite! Oh, yes, there is blue sage. are the fresh-cut flowers for sale. Each individual flower shimmers in the sun. The unopened buds are spurs, much like columbines. Oh my...how I love blue columbines. Maybe that is really my favorite flower. 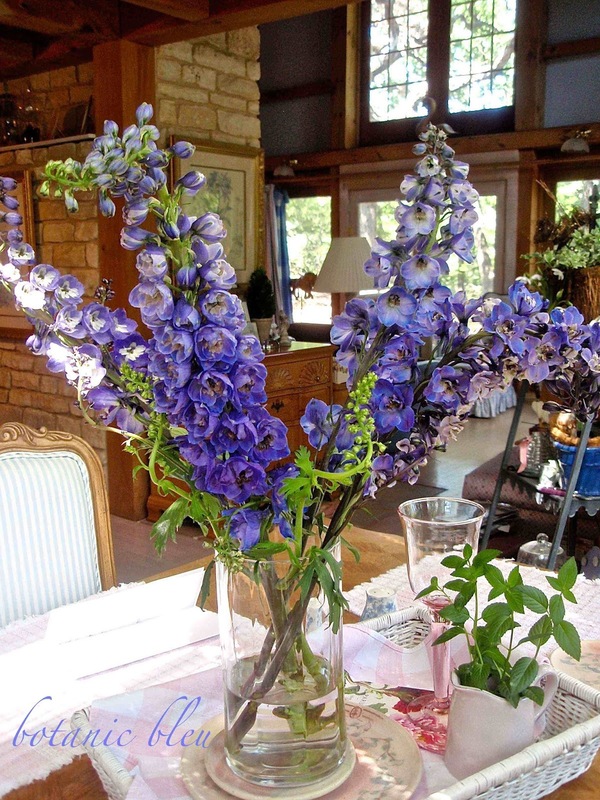 I have not had delphiniums in years. nor do the local florists I sometimes frequent for special occasions. nor does anyone I know in north Texas grow them. even my Olympus camera is blue. 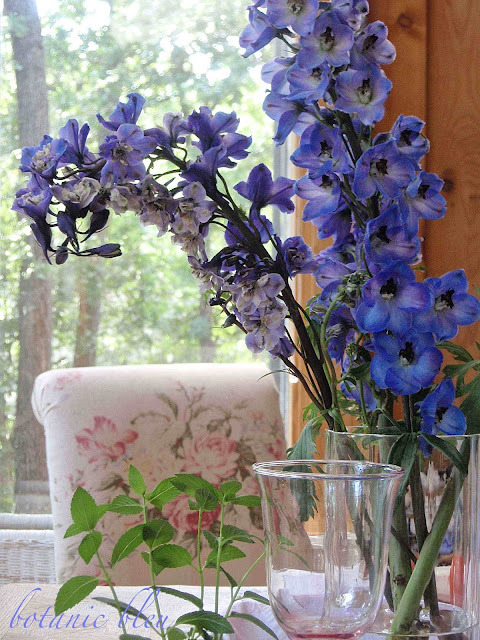 The blue delphiniums were the first thing in my basket at Trader Joe's. The pink peonies were a fast second. and the price was too good to believe. they are beautiful from every angle. 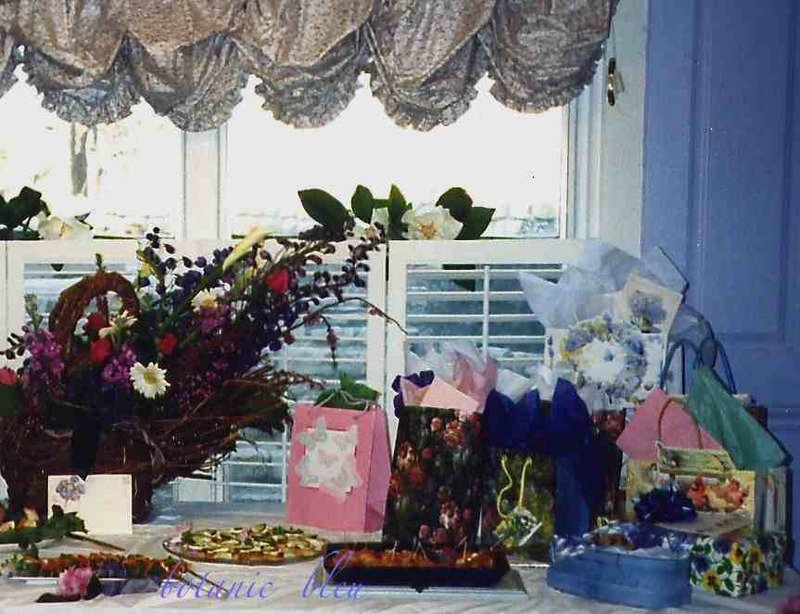 Look closely; the floral centerpiece has dark blue delphiniums. 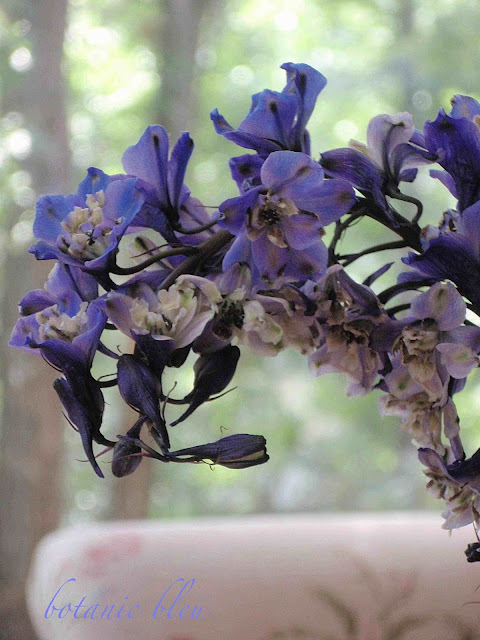 Can it be that long ago since I had delphiniums? to grace my table again. They just may be my favorite blue flower after all. Well, for a while anyway. Love blue delphiniums, but don't grow them either. Looking forward to when Trader Joe's opens here in Austin. My blue plumbago blooms its head off in this summer heat as does my blue daze. My blue agapanthus not so much. I only saw half dozen blooms this season and about the same on my blue iris. I need to consult an expert. 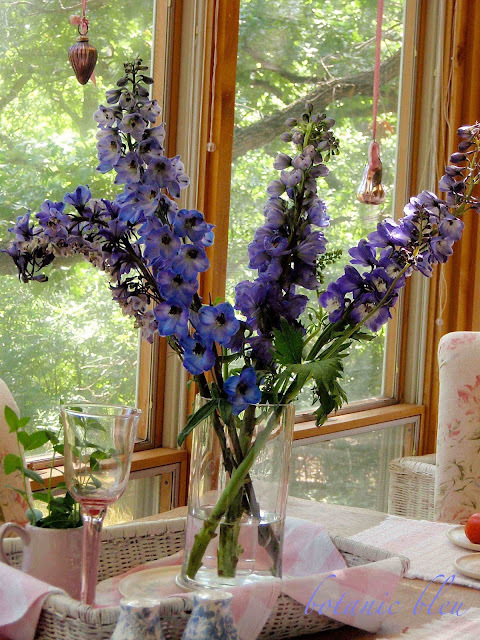 Oh, your blue flowers are beautiful, and they look so nice on your table. It looks like they have a bit of purple in them, and I think that's why they are so pretty to me, as purple is my favorite color. Delphiniums are a striking flower, especially for a vase and can be found in many hues of your favourite blue. 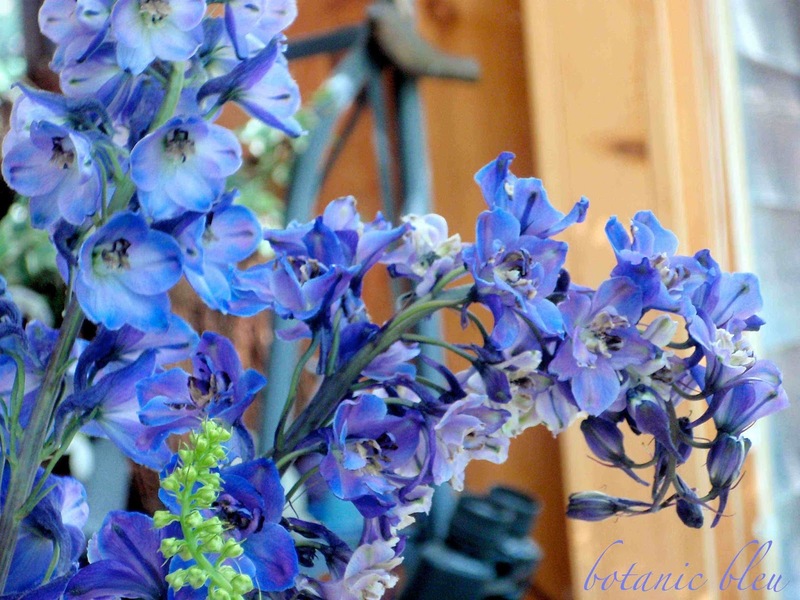 Love, love, love the blue delphiniums! They are gorgeous! Alas, the closest Trader Joe's is at least a 45 minute drive! I love that you have a blue camera! My Nikon is black, BUT my laptop is cobalt blue! DH bought it for me and I was surprised that he thought to buy it in blue! Have a wonderful day! Lovely photographs! Thank you so much for visiting L'Heure Bleue At Home. The words L'Heure Bleue have always resonated with me so it was natural that I used it for my blog. I guess I didn't think of the fact that it might be hard to pronounce as French is one of Canada's national languages. So happy to "meet" someone who appreciates French inspiration as much as I do! The delphiniums are beautiful. I don't know that I have ever had any in my house. I don't do the grocery shopping and Steve walks right past the flowers when he is at TJs. I think I need to go with home today to see what is available. 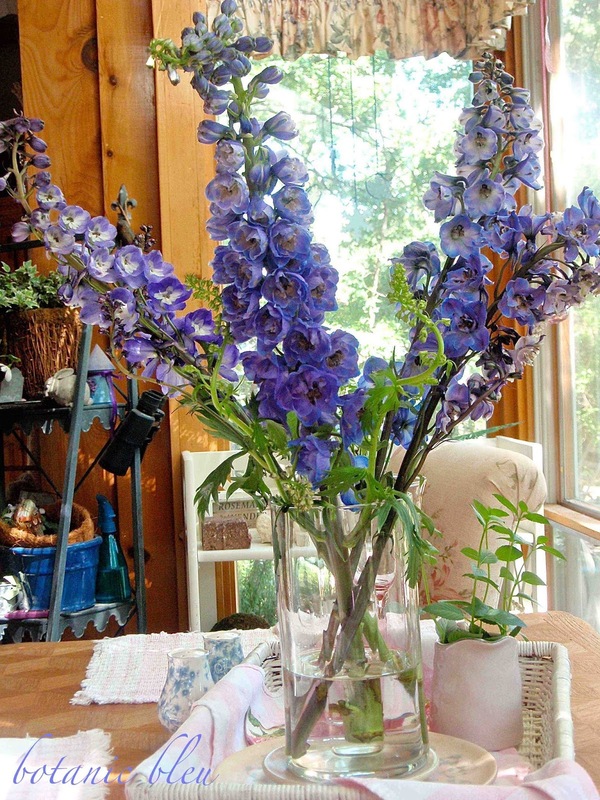 I love delphiniums and I can grow them here in the northwest! I am not sure why I don't because they are just gorgeous. I love your arrangement! Visiting via the cottage garden party. They ARE blue-tiful, and I don't blame you for changing your preferences! Very pretty. 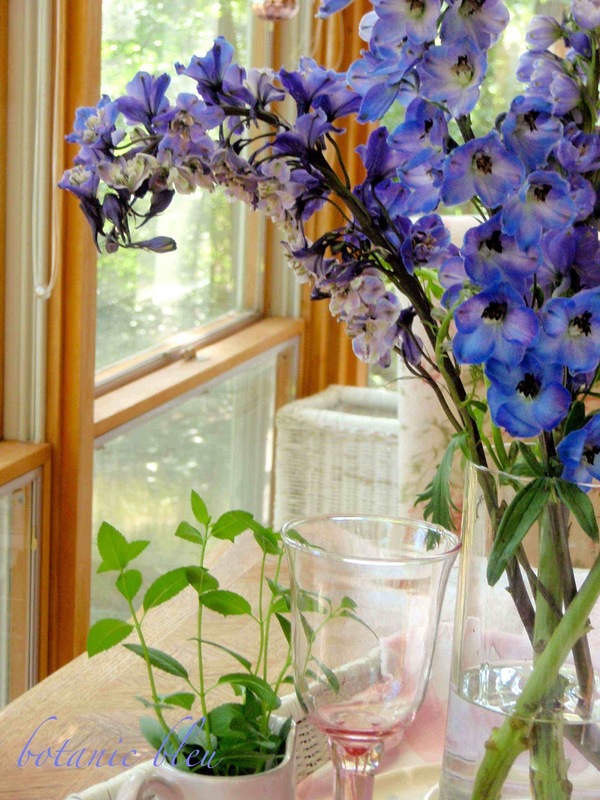 I love delphiniums. They always stand out among the other flowers in any garden or arrangement. They are indeed a lovely flower. I like all flowers, no matter the color or what. The last time I went to Trader Joe's, I decided I could find my needs closer and less hectic. They should have located in a less congested area. They are beautiful and your photos are amazing! Thanks so much for sharing at Amaze Me Monday!